비로자나불을 중심으로 석가와 노사나불 등 삼신불이 진리를 설법하고 있는 장면을 그린 괘불이다. 괘불이란 절에서 큰 법회나 의식을 행하기 위해 법당 앞뜰에 걸어놓고 예배를 드리던 대형 불교그림을 말한다. 이 그림은 길이 12.47m, 폭 9.48m의 크기로 전체적으로 상·중·하 3단 구도를 이루고 있다. 맨 윗부분에는 관음보살과 대세지보살상, 제자상, 금강역사상 등이 배치되어 있고, 가운데에는 비로자나불, 석가, 노사나불 등 삼신불이 묘사되어 있고, 맨 아래에는 문수보살과 보현보살상, 사천왕상, 사리불 등이 있다. 가운데부분의 비로자나불은 등뒤로 광배를 가지고 있으며 둥근 얼굴에 두 어깨를 감싼 옷을 걸치고 오른손을 왼손으로 감싼 지권인의 손모양을 하고 있다. 큰 얼굴과 큼직한 손에 비해 몸은 다소 왜소하며 어깨에 비해 무릎 폭이 넓은 모습이다. 비로자나불의 왼쪽에 있는 노사나불은 머리에 화려한 보관을 쓰고 두 손을 어깨까지 들어올려 설법하는 자세를 취하고 있으며 오른쪽의 석가불은 악귀를 물리친다는 뜻의 손모양인 항마촉지인을 하고 있다. 비로자나불과 석가불은 기둥처럼 솟은 특이한 머리모양을 하고 있다. 맨윗부분은 붉은 색의 두광을 가진 관음·세지보살과 십방제불, 나한 등이 화려한 빛깔의 구름과 어우러져 아름다운 천상세계를 만들고 있다. 비교적으로 단순한 구성을 보이고 있는 맨아래부분은 사천왕과 문수보살·보현보살, 사리불이 배치되어 있다. 채색은 녹색, 홍색, 황색과 같은 중간 색조와 금으로 채색하여 화면 전체를 밝고 화려하게 나타내었다. 이 괘불은 효종 원년(1650)에 제작되었는데 중단의 삼신불을 크게 강조한 독특한 구성을 하고 있다. 또한 그림에 괘불 조성에 필요한 많은 물품의 시주자를 적어놓고 있어 17세기 중반의 생활상과 사찰의 재정규모를 파악할 수 있는 중요한 자료가 되고 있다. 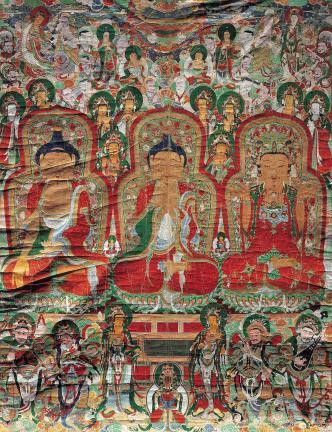 Gwaebul is a large Buddhist painting that is hung at the front garden of the sanctuary during sermons or ceremonies. The Samsinbul, or the three Buddhas, Sakyamuni, Nosanabul with Vairocana Buddha in the middle, preaching truth is the subject of this gwaebul. It is 2.47 m long and 9.48 m wide. It is arranged into three sections; upper, middle, and low. 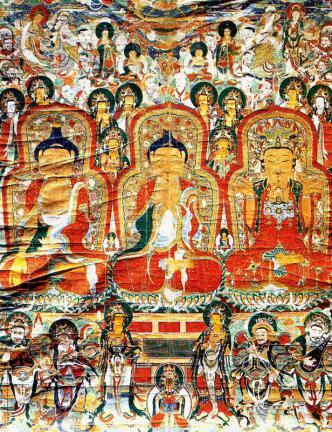 In the upper section there are the images of Avalokitesvara, Bodhisattva of Power, Buddha's disciples and guardian deities. 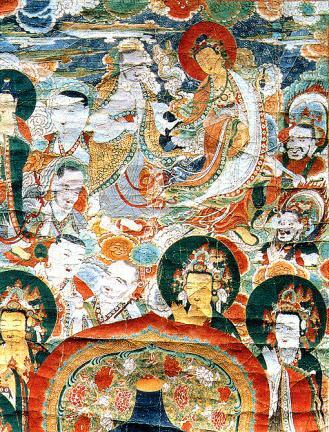 The Samsinbuls are in the middle and the images of Manjusri Bodhisattva, Bodhisattva of Karuna, the Four Guardian Kings and Sarira Buddha are in the lower section. Vairocana Buddha or Buddha of Enlightenment in the middle has a nimbus behind his back and has a round face. He is cloaked in clothes covering his shoulders and holds his right hand in his left hand. Considering his large face and hands, he has a rather small body and the distance between his knees when sitting cross-legged is longer than the width of his shoulders. 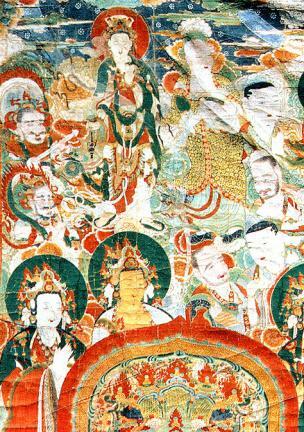 Nosanabul sitting at the left side of Vairocana Buddha has a jeweled crown on his head. He has both hands lifted to his shoulders, which makes it look as if he is going to preach. The image of Sakyamuni at the right side of Vairocana Buddha has his fingers pointing downwards, the figure of putting off demons. Both Vairocana Buddha and Sakyamuni have singular hairstyles, protruding upwards like a column. The reddish aura of Avalokitesvara, Bodhisattva of Power, the Buddhas of entire world and Buddha's disciples and the splendid colors of the clouds in the upper part of the gwaebul create the image of a beautiful heavenly world. Compared to the upper part, the lower part is more simply arranged. 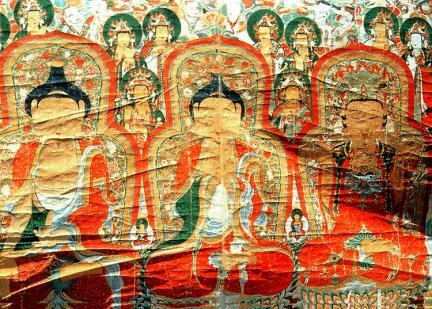 Images of the Four Guardian Kings, Manjusri Bodhisattva, Bodhisattva of Karuna and Sarira Buddhas can be seen in the lower part. Middle tone colors, such as green, red, yellow and the golden color lighten up the whole picture. This gwaebul is unique in that it emphasizes the Samsinbuls in the middle. The date of production is recorded as around 1650. A list of donators of the many materials necessary for the drawing of this picture is also recorded, which makes it possible to assume the financial background of temples in the 17th century.